HI, THANKS FOR VISITING. THIS PERSONAL WEBPAGE WAS STARTED ON 1-13-98. I AM INTERESTED IN MANY THINGS, AS YOU CAN TELL FROM MY LINK PAGES. E-mail me your favorite links! The photo above is a beach cam, so do not worry if it is not a good image, or a clear one. Anyone recognize it? HAVE FUN AND HAPPY SURFING! ALOHA,SANDY ~~~~~~~~~~~~~~~~~~~~~~~~~~~~~~~~~~~~~~~~ ~ 2-4-99 Go to the INDEX TO MY WEBPAGES to see all the other webpages I have made! They have many pictures that Glenn took. I have ones on our OLD TOYS, CHRIS ISAAK, ROBOTS, TONKA TRUCKS, and etc. Not bad for making them with WebTV! ~~~~~~~~~~~~~~~~~~~~~~~~~~~~~~~~~~~~~~~~ 2-20-99 I have been working on a Music Page (link below) to tell about my favorite old blues guys and how they have influenced the musicians of the 60's and up to today. The CD's I mention on the page are the ones I own, love, and recommend. ~~~~~~~~~~~~~~~~~~~~~~~~~~~~~~~~~~~~~~~~ 4-21-99 I bought a digital camera and have many pics on my Gallery page. There are also many pics there taken by my friend Alex, a self sufficient, organic farmer. ~~~~~~~~~~~~~~~~~~~~~~~~~~~~~~~~~~~~~~~ 7-8-99 I have moved, started a new job, and been so busy! I have ignored my webpages! I will get back to them eventually... ~~~~~~~~~~~~~~~~~~~~~~~~~~~~~~~~~~~~~~~~ ~~~~~~~~~~~~~~~~~~~~~~~~~~~~~~~~~~~~~ 7-1-00 My latest kick has been genealogy. A lady who lives in our town called and said her family has the same last name. She isn't related, but she sparked my interest in learning about the past. ~~~~~~~~~~~~~~~~~~~~~~~~~~~~~~~~~~~~~~~~~~~ 9-28-00 I have found out quite a bit about our families. I can go back to the mid 1700's on one tree. The other side has been in the US since the 1600's, but I am missing some of the links for it. ~~~~~~~~~~~~~~~~~~~~~~~~~~~~~~~~~~~~~~~~~~~~ CHRIS ISAAK IS MY FAVORITE MUSICIAN. THIS PICTURE WAS TAKEN AT THE OPENING OF THE NEW PAC BELL PARK IN SAN FRANCISCO. IT WAS QUITE A DAY! AND CHRIS ISAAK GAVE A FREE CONCERT THAT NIGHT! I HAD A GREAT TIME! 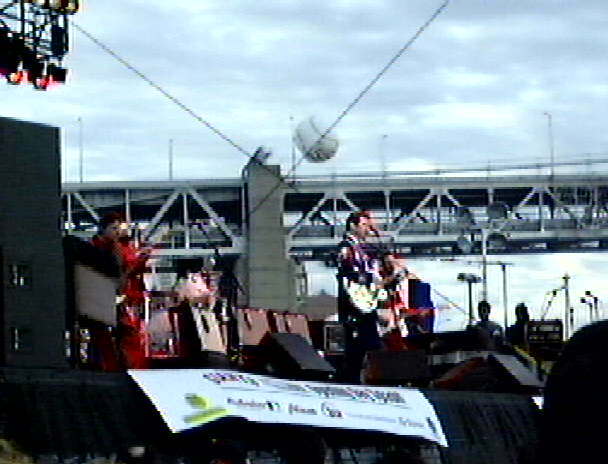 CLICK ON CHRIS ISAAK PHOTO BELOW TO SEE A CONCERT PIC, SHOT TOWARD THE BAY BRIDGE. ~~~~~~~~~~~~~~~~~~~~~~~~~~~~~~~~~~~~~~~~~~~~ Nov 2000 We went to the Monterey Bay Aquarium again. It's nice and has good displays, but is always so crowded! See the link below for my pics. ~~~~~~~~~~~~~~~~~~~~~~~~~~~~~~~~~~~~~~~~~~~~ May 12, 2001 See Hawaii 2001 link to view pics. We had a fun time swimming, walking, and watching the clouds. ~~~~~~~~~~~~~~~~~~~~~~~~~~~~~~~~~~~~~~~~~~~~ July, 2001 Reruns of the Chris Isaak Show on Showtime just started. Catch the show, it's really funny. But, it's adult humor, so be warned.